Entertaining audiences of all ages and ethnic groups is our specialty. For our seniors who love to dance and participate in line and group dancing - we are the one for you. For our seniors who love to hear us sing (live) to the old songs from way back then - we are the one for you. We know how important it is for our seniors who know the difference between loud music and great music. Whether you are eating, talking or dancing, the music is always kept at an appropriate level so everyone is comfortable. We will get you in the mood to sing all your favorite songs with us to make it as memorable as possible. I have worked in Senior Centers for the past nine years. 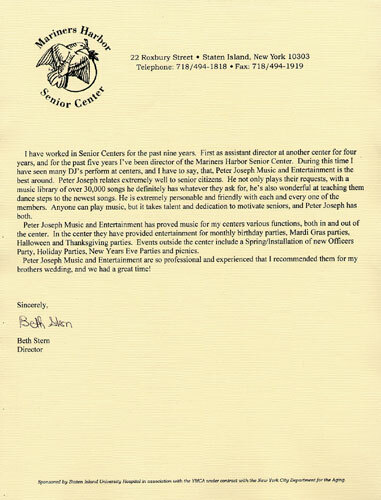 First as assistant director at another center for four years, and for the past five years I've been director of the Mariners Harbor Senior Center. During this time I have seen many DJ's perform at centers, and I have to say, that, Peter Joseph Music and Entertainment is the best around. Peter Joseph relates extremely well to senior citizens. He not only plays their requests, with a music library of over 30,000 songs he definitely has whatever they ask for, he's also wonderful at teaching them dance steps to the newest songs. He is extremely personable and friendly with each and every one of the members. Anyone can play music, but it takes talent and dedication to motivate seniors, and Peter Joseph has both. Peter Joseph Music and Entertainment has provided music for my centers various functions, both in and out of the center. 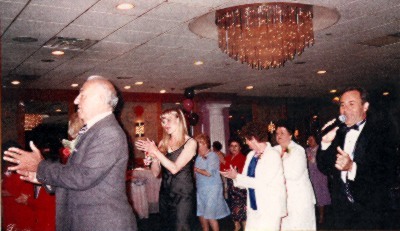 In the center they have provided entertainment for monthly birthday parties, Mardi Gras parties, Halloween and Thanksgiving parties. Events outside the center include a Spring/Installation of new Officers Party, Holiday Parties, New Years Eve Parties and picnics. Peter Joseph Music and Entertainment are so professional and experienced that I recommended them for my brother's wedding, and we had a great time!